A cloud readiness assessment provides an organization with the clarity of vision and concrete steps required to successfully adopt cloud. As cloud agility and elasticity are increasingly being sought after by companies, a formal organizational review and cloud migration assessment serves an invaluable function for achieving these goals. Cloud Readiness Assessment Definition: A cloud readiness assessment is an overarching process that encompasses organizational readiness, application discovery and application assessments. The primary goal of a cloud readiness assessment is to provide you with a gap-analysis of your organization and a list of applications that can be moved to the cloud smoothly, following a prescriptive cloud application assessment process. Various tools are available for organizations to assess how prepared they are for the cloud, though all tools are not created equally. While organizations are demanding more application-centric cloud assessment tools, the industry has so far provided server and infrastructure assessment tools which tend to cater to IT only, rather than the context of the business they support. Cloud native transformations are increasingly sought after, and you should ensure that your tools will help you transform your application portfolio now and in the future. Complex cloud migrations, made simple. How many applications do you have to migrate? Received! We will be in touch. A cloud migration assessment takes the cloud readiness assessment further, providing tangible solutions to migrating applications to cloud and follows the 6Rs of migration: Refactor, Replatform, Repurchase, Rehost, Retire and of course: Retain. Have measurable goals early on in the cloud migration project. These objectives may be as high level as ”Save $1bn in OPEX annually” or as specific as ”Reduce time to recovery for application XYZ to two minutes”. The point is to have them and for the team to know them, as there will be many decision points along the cloud journey that will be solved quickly with these targets in mind. Application Discovery and data imports can help here and for mature organizations already practicing application portfolio management, this can be a simple export to Excel to start. While we advocate for transformation where possible, knowing the overall size of an existing computing environment will inform some decision making early on. Teams should not dwell on capturing all the minutiae of server configurations. In today’s cloud migration, an inventory of MAC addresses and running processes is not required. This can appear to be a roadblock in an IT-led cloud initiative but with clear application ownership established, a cloud migration that is aligned to the business needs is possible. Be respectful of your application owner’s time, and conduct 15 - 30-minute application interviews only. With the right tools, you will efficiently capture just the information you need and no more. All that is needed here is to see a high-level of which applications are running on what servers in your enterprise. We tend to stick to three levels of depth here: Applications, Database instances, and Servers. The goal of this step is to highlight the level of complexity that each application has, and start to gain an understanding of the underlying infrastructure. These are details such as which application stacks, database servers and programming languages are used. 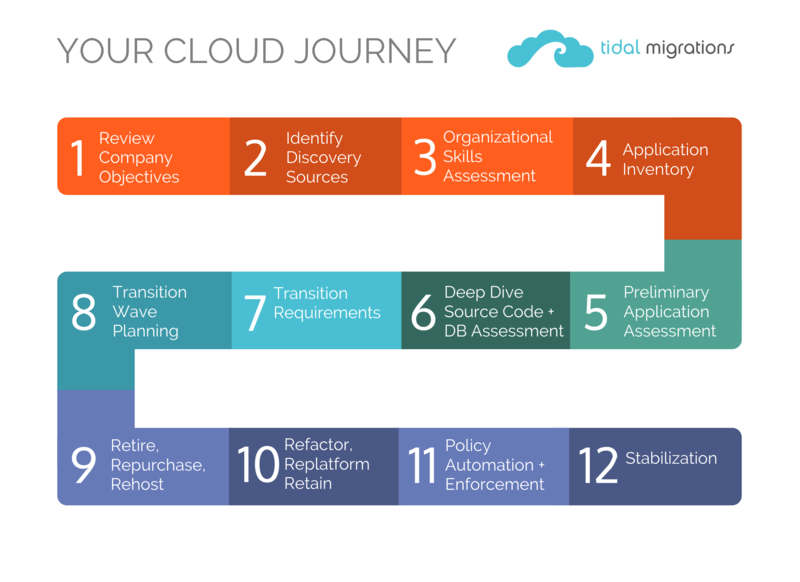 Cloud migration platforms like Tidal Migrations include tools to rapidly capture these, and static source code analysis can provide more insights on software libraries in use for the code an organization maintains. Based on the information collected from the business and the technology sources, earmark each application for one of Refactor, Replatform, Repurchase, Rehost, Retire or Retain. This will serve to indicate software complexity and dependencies which is all input for estimating these transforming applications. By the end of these steps, you will have a feel for how to group applications together and an idea of effort estimates for your cloud migration. Now you can begin the cloud migration planning phase of your journey. Simplify your cloud readiness assessment.